Central Oregon, ready to be taken down. Our tipi covers are made out of 100% cotton. Cotton is a natural fiber and will deteriorate over time. It also molds quickly in a wet environment. Each cover is treated with a Sunforger® finish that includes a mold and mildew protector. This finish does not make the tipi mold and mildew proof, it only temporarily inhibits the development of the most commonly found mold and mildew spores. Your tipi cover could mold within a week of rain, if there are spores in your environment that the Sunforger® treatment does not cover. Due to stricter regulations of the Environmental Protection Agency (EPA), these treatments are not as effective as they were many years ago. Both mercury and copper are chemicals that work well for mold and mildew inhibition, but are not allowed to be used anymore. With exposure to sun, wind, rain and snow, the treatment will also wear off over time. A tipi left out in constant humidity might now start molding within a few months. We had cases in England, Australia, Asia and the Southern USA where a cover molded in the first month. If the tipi has the chance to dry out in between rains, it might take one to two years until the first signs of mold appear. Tipis in dryer climates may never mold. The tipi on the top of this page has been standing year-around at our shop in Central Oregon, a High Desert climate at 4000 ft altitude, for eight years now, without signs of mold. Locations above 3000 ft in elevation and places with a depleting ozone layer may have strong UV radiation that affects the tipi fabric. Your canvas could break down after 1-3 years, initially on the south side. If you are in high elevation, a shady location will help prevent the premature breakdown. If you cannot avoid ‘baking’ your cover in the sun, we recommend that you treat your canvas once a year with an additional protective finish. Mold and mildew can form on your fabric within only a few weeks despite the Sunforger® treatment on the canvas, as it only protects against the most common mold spores known in the USA. If mold and mildew is a known issue in your area, we recommend that you put an additional treatment your canvas even before you set your tipi up for the first time. Mold and mildew can develop if the tipi cover does not have a chance to dry out. Be sure to put an electric heater in your tipi when you get rainfall over several days, or make a fire in it. An electric or solar powered ventilator also helps move the air around, so that mold and mildew spores do not settle on the canvas. Also, cut down wet grass around the bottom of your tipi. 4) Snow pile-up on the canvas and around the bottom without having a heat source in the tipi. After a heavy snowfall, brush off the snow, so the heaviness of it does not sag or stretch the canvas. Remove the snow around the bottom of the tipi in order to maintain the ventilation function created by the cover-liner gap. If all snow is removed from the tipi, heat it from the inside to dry out the canvas. Treat your cover with a water repellent finish that will shed the water and salt off of your cover. Stake your tipi down firmly to the ground, close the smoke flaps when you expect high winds (Photo 62) and stake the cover rope into the ground inside the tipi (Photo 59). Due to the unpredictable nature of environmental influences, we cannot guarantee our fabrics against mold and mildew formation or breakdown due to excessive ultraviolet radiation. If your tipi gets moldy even in the first few months, it will be your responsibility to clean it and renew the protective finish. 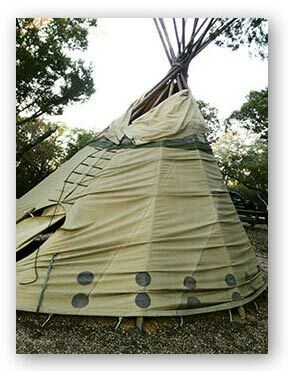 12ft tipi = 250sqft / 14ft = 350sqft / 16ft =475sqft / 18ft = 560sqft / 20ft = 725sqft / 22ft = 875sqft / 26ft = 1125sqft. Be sure to read the instructions for each product. Normally, they recommend using a pressure spray bottle (available at Home Improvement or Landscaping stores) and recommend 4-12 hour of drying time without exposure to rain. Best is to treat your canvas while it is on the ground, then let it dry to the touch while you prepare the pins and widen the lacing pin holes, prepping the staking cord and putting up the pole structure. If your tipi is already up, use a ladder to reach the upper parts. However, treating the first 3ft at the bottom is the most important area. Heat and high UV radiation makes the canvas brittle. A black painted top can worsen the effects of this. 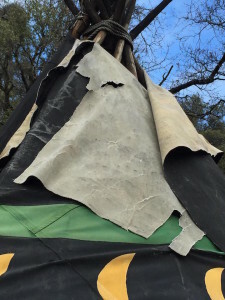 3 yr. old tipi in California without UV protectant. The 303 fabric guard is a product line recommended by Sunbrella fabrics that offers protectants and cleaners. Wet and Forget is the easiest to apply, but it may take up to 6 months to see results. If you have feedback from using any of these products we would love to hear from you. So far, our own research has shown that Clorox “My Ultimate Care” bleach works best for the removal of mold and mildew. Use your door for testing, as different mold strains react differently. Start with a 50% watered down solution, sponge it on and let it sit for 5-10 minutes. Then rinse it off. If this doesn’t work then try “My Ultimate Care” bleach full strength. The pictures below show the before and after application of the 50% solution applied once. It works wonderfully on the white canvas and does not harm the paint. You can also apply this on the tan canvas, it will lighten the fabric slightly. 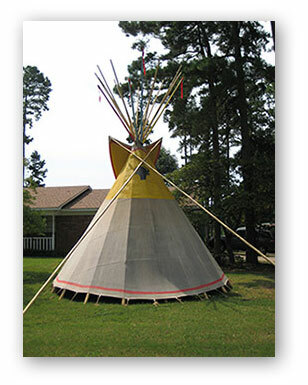 Example of a tipi that has been treated using “Ultimate Care” bleach. We recommend that in constant wet and humid climates, you purchase a water repellent finish and treat your cover before you set it up. Then you re-treat the outer canvas with a protective mold and mildew finish once a year. The same applies for locations with high UV radiation; applying a protective finish against UV radiation each year will prolong the life of your canvas significantly. Below are some links and tips for the care of your tipi in the U.S. For our international teepee friends, we recommend that you do an Internet search in your language for fabric protection products that are used in the boating industry. Sometimes tipis are left alone for months on a remote piece of property. When the owners come back for their weekend get-away, surprises can await them. It is not uncommon for tree branches to fall onto the canvas and rip it. With some foresight, this can be prevented by choosing the tipi location carefully and cutting branches that are dangerously close. Another surprise comes with roaming animals. We have heard of deer poking their antlers into the cover or stepping on it, bears ripping tipis apart because they smelled some food leftovers, or coyotes making their way through the door in pursuit of the chipmunks – not to mention havoc that rodents can cause. 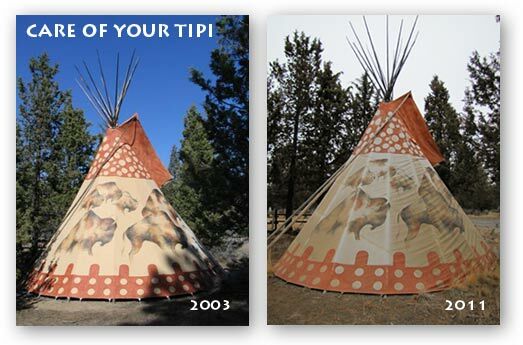 If you have rips in your tipi cover, send a picture to nomadics@tipi.com and call us at 1-541-389.3980 to discuss the damage, we are happy to give advice and send you a repair kit. Strong weather is another cause for concern if the tipis are left unattended. This happened to Stephanie in Texas. She sent us this picture of a three-year-old tipi, wondering what went wrong. The tipi was left alone for a while and it looks like strong wind from the left side of the tipi had shifted the poles. This can happen if the poles are not put up in the correct order or if the cover rope is not wrapped tightly enough around the poles. Also the smoke flaps had not been closed, giving the wind a chance to push the cover from the inside. Whenever you leave your tipi alone for a bit, be sure to close the smoke flaps securely, as pictured in our set-up instructions. 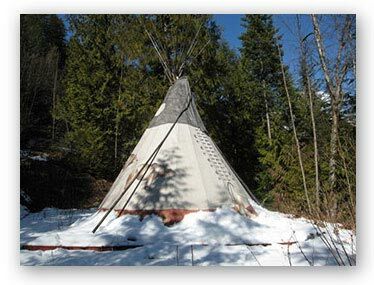 Leaving your tipi up over the winter without tending to it can cause snow to build up on the canvas. In wet climates, the snow gets heavy and will eventually stretch the canvas. The constant exposure to moisture will also cause the tipi to mold once the weather gets warmer. As much as possible, try to get snow off your tipi, especially around the bottom. Dean’s tipi, doomed to mold, Canada. One common oversight that new tipi owners make is forgetting to cut their smoke flap poles to the proper length. The proper length is 2ft longer than the stated size of your tipi. So, for an 18ft tipi, the two smoke flap poles should be cut to 20ft in length. For a 20ft tipi, the smoke flap pole length should be 22ft, etc. Choose the two thinnest poles for your smoke flap poles. Cut your two poles in such a manner that the small end that goes into the smoke flap pocket is 1.25” – 1.5” in diameter. Here is one of those beautifully set up tipis, but the smoke flap poles are much too long … although we have to admit, Homer has taken great care of his lodge otherwise: He bought the tipi in 1983 and sent us the picture in 2009 -a 26 year old teepee. Another mistake is not using smoke flap poles at all. This way the smoke flaps will lie on the canvas and create a damp, dark place where mold can easily thrive. Please use your smoke flap poles and also tie a 1/4″ rope to the smoke flap loops to help hold them taut to the tie stake in front of the tipi.